We Create Application on Mobile Stable on Blackberry, iPhone, or Android. Rubicz has been handling several large clients residing in Indonesia and hopefully it will get larger covering the world :p . And you can see some crafts we have done below this page. We’ve been doing our jobs in the perfect ways. We work really hard to achieve the client’s need. And make sure that all that needs are accommodated in our works. We simply believe that we strive to offer the solution for the good of your business and giving advice at an very honest price. We are constantly investigating new technologies and recommend them when they make sense. We're doing our jobs in the perfect ways. 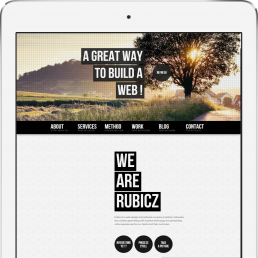 Rubicz is a web-design and software company in Batam, Indonesia. We combine great ideas with creative technology to build exciting online experiences for our clients and their customers. Not only designing website and application of software, we are also crafting some logo design and designing for print advertising. We work strictly with you and carry out research to understand your needs and the needs of your customers first. We work with clients big and small across a range of sectors and we utilise all forms of media to get your name out there in a way that’s right for you. IT Consultancy is an integrator of IT Infrastructure that provides Solutions, Support and Services to companies, organisations and small businesses. 7 year's experience in IT Infrastructure, we can design, implement and maintain complex hardware and software system architectures. Our focus is to provide affordable professional IT Solutions & Services that meet the client's technology requirements whilst offering IT Support at competitive rates. IT Consultancy is uniquely placed to fulfil your IT needs. Embarking on a new project can be daunting. Knowing that you have a team on your side who care about the growth of your business makes it easier. We work harder to deliver a high standard of services that fit with your digital strategy and meet your campaign’s requirements. Feel confident your thoughts are heard. Once we understand, we give our advice in a simple, concise and jargon-free way. In the world of digital marketing and web design, a curiosity for what’s new and exciting should be accompanied by a wariness of trends. So, we always combine our previous wins, learning curves, industry knowledge and passion for innovation with tailored strategy – for proven results to enhance your business. Make your vision and ideas reality with our top team of creative minds. Website design and development, building web applications and custom programming (software developer), company branding, graphic design and a range of other complimentary digital marketing services will be attractive, user-friendly and deliver strong branding and a great user experience.